And it's not just because of the mech arms! People have been boxing since ancient history. It’s a sport that strikes at the core of humanity’s basest instincts and requires nothing more than one’s two fists. In fact, archaic versions of boxing didn’t even use gloves! We’ve sure come a long way since then. However, the punch doesn’t stop with modern innovations in the sport. 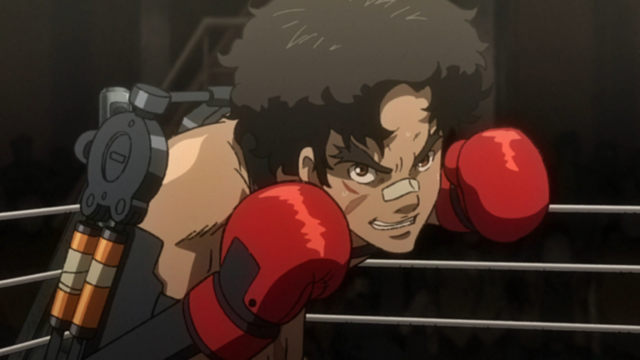 MEGALOBOX shows us a future of boxing that’s even better than the real thing, and not just because of the mech arms. Now don’t get me wrong, the mech arms sure are cool! 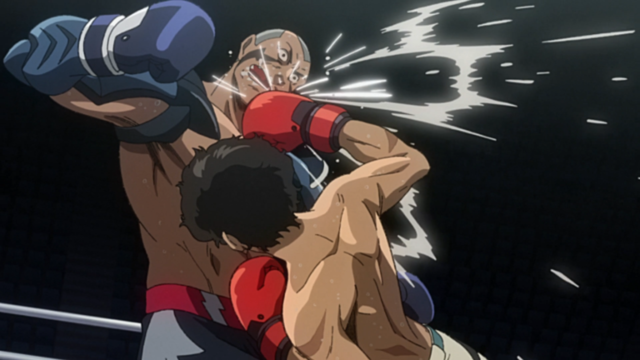 Their ability to boost punches to super-sonic-and-pushing-lethal speeds raises the stakes on Megalobox’s brutal boxing matches. A well-placed gear-powered punch is a quick knockout (or even worse). In many ways, the superpowered metal frames are actually the antithesis to the advent of boxing gloves in that they make the sport way more dangerous and impractical. But that’s also why they work so well in the context of a fictional world. The gears amp up the visceral pleasures of these punch-ups to treacherous heights. Yet it’s not the gears that make Megalo Boxing so dang exciting to watch but rather “Gearless” Joe’s circumventing of them. By opting to use nothing but his own strength, Joe puts himself at a deadly disadvantage. His opponents effectively become Saitama from One Punch Man with their ability to blow him away in a single strike. But Joe has something more important than raw power: his scrappy cunning. By facing up against the immeasurable strength of gears with only his wits, Joe strikes to the core of what makes boxing more than two people punching each other. The strategies he employs to not get hit-- ducking and dodging, leading the fight, having the opponent step to his rhythm-- prove to be more fruitful than trading hefty blows. 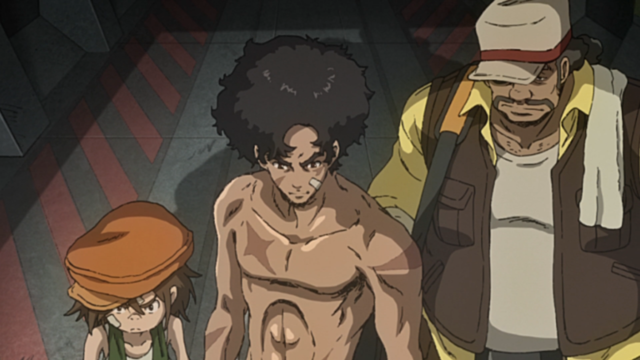 This dichotomy of brains vs brawn is the essence of the sport and nowhere is it elevated more than in Megalobox. Another way in which Megalobox makes boxing more thrilling than the real thing: its diversity of fighters. In the real world, boxers compete in different weight classes so as to keep the competition even. In Megalonia, it’s every man for himself. As long as you’re a citizen you can compete against the big dogs. Starting out in dead last, the scrawny Joe has to take down hulking foes to reach the top. The odds are stacked against people like him so it’s particularly exciting when he manages to persevere against all expectations. Sure, every sport has its underdogs but their disadvantage tends to lie with inferior skill, experience or execution. Megalonia’s underdogs are quite literally small fry with lesser physical attributes. Which brings us to the idea of narrative in sports. A good sports league or tournament is defined by the storylines weaved throughout it: stiff competition, boiling rivalries, top dogs, underdogs, a touch of drama, and everything in-between. People tune in regularly because of the people playing. They want to see stories unfold. What story could be more compelling than the guy in dead last looking to settle a score with the champion sitting on his first place throne? Megalonia only becomes more compelling as Joe manages to win the fights he needs to in order to achieve his goal. But it’s not just Joe; narratives exist throughout the 257-person tournament roster. For example, Joe’s first opponent Shark Samejima is infamous for his dirty tactics and the champion Yuri is seen as a god-amongst-boxers who could never lose, yet his vulnerability is revealed when Joe forces him to fight with both arms. These heightened characters may be unrealistic (there’s no way Shark would be allowed anywhere near a legitimate tournament) but that’s what gives Megalonia its distinctive edge. A tournament is only as good as its competitors, and this one has some real beasts. The points I’ve brought up so far come with the stipulation that Megalo Boxing's greatness is achieved through fiction. That in-and-of itself is an aspect of this boxing variant that makes it the best version of the sport, at least for certain audiences. 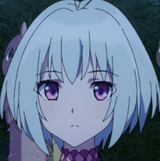 By being a product of animation, Megalobox doesn’t result in any real people getting hurt. Anyone who’s squeamish about the reality of people punching one another but want the rush of a good brawl will find that here. Sometimes no pain is all gain. This isn’t to say that the physical toll of real boxing is in any way a bad thing, however. Professional boxers know how to take a punch with minimal damage to themselves (as much as that’s possible, anyway). But for some, the violence is too much without the barrier provided by fiction. Lastly, Megalobox’s fights are especially potent because they put you inside the ring with the combatants rather than passively observing them from the sidelines. We get to hear the thoughts inside Joe’s head as he faces down his opponent, see what he sees, (through audio-visuals) feel what he feels. Essentially, this series allows the viewer to project themselves into a sport that they otherwise wouldn’t be fit to take up themselves. They become an active participant in what they’re watching, fighting alongside Joe. This makes his triumphs and struggles even more relatable. 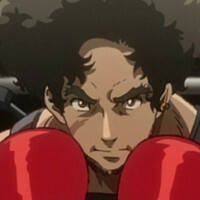 By escaping from reality and subverting its trademark powerhouse mech arms, Megalobox transcends the realities of boxing while heightening the tenants that make the sport timeless. Boxing has simply never been this good. Tim Rattray (@thoughtmotion) is a features and social video writer for Crunchyroll and founder of Thoughts That Move. 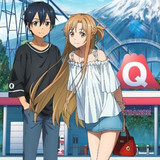 He also writes Talking Otaku, a weekly anime column on MANGA.TOKYO. 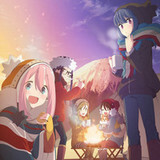 What Are The New "Big 3 Shonen" Series? Meet the People Behind Alita: Battle Angel at Crunchyroll Expo!